When Kyndyl started looking into getting a service dog to help with his PTSD (Post Traumatic Stress Disorder), he found that it was going to be very difficult since he wasn’t a veteran. When most people think of someone suffering from PTSD, they picture a person who served in a combat zone overseas; but war is not the only type of trauma a person can experience. As an adult, Kyndyl coped by keeping himself busy. He worked part-time while attending college, then graduated with a dual degree in religious studies and psychology. For a time, he sustained 40-60 hour work weeks – carrying on as if his past didn’t affect him – only to severely crash and wind up hospitalized, then unemployed, then dependent on a meager social security disability income. Even though his condition was severe enough to have left him medically disabled, there was no funding available to help a mere civilian with PTSD get a service dog. Kyndyl did a lot of research to find out what his options were, but unfortunately there weren’t even any programs for non-veterans in his area. He knew that it was theoretically possible to owner-train a service dog, but he needed guidance. Reaching out to handlers and trainers, Kyndyl was disappointed to discover dismissive, condescending attitudes at every turn. It seemed everyone was quick to tell him – sometimes quite rudely – that a person like him didn’t “deserve” a specially selected and trained service dog with thousands of dollars worth of time and training poured into it, or that owner-training as an alternative couldn’t successfully be done. Frustrated and depressed, Kyndyl ended up in the hospital more than once due to the stress and apparent hopelessness of the whole situation. He badly needed help; but the sad reality was he had little money, and no one was going to help him for free. One trainer crushed Kyndyl’s dreams by telling him he was “too sick” to train his own dog, but did refer him to a program that would train service dogs specifically for people suffering from PTSD. He thought this might be a breakthrough. Unfortunately, that so-called “program” turned out to be more of scam, run by a couple who had few morals but plenty of lies. Kyndyl was just about at the end of his rope when Sharon stepped in and gave him hope again. She didn’t discourage owner training a dog or outright tell him he couldn’t use specific types of dogs like Pitties or German Shepherds. Still, Sharon was honest with him that certain breeds might be harder to train than others because of their natural inclinations, or would possibly invite problems with public access due to people’s prejudices. Kyndyl was intent on rescuing a dog. He had volunteered with rescue organizations before, and that was where his heart was. His previous dog was a German Shepherd that had wound up in a shelter in Tennessee after being severely neglected. When Kyndyl first rescued DJ, she was malnourished and underweight, ribs and vertebrae visible from 10 feet away. Under his care, she went from being only 35 pounds – at the age of no more than 2 – to nearly 100 pounds. Without any previous training, DJ instinctively became a seizure alert dog. When Kyndyl’s older Lab started suffering from seizures, she tried to wake him from them. 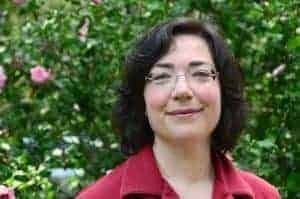 Then she transferred that skill to notifying Kyndyl when his partner also began having seizures, giving 15 minute warnings prior to their onset. In a large way, DJ was the inspiration behind Kyndyl’s looking into service dogs in the first place, and she perfectly illustrated the fact that a good service dog will naturally possess certain qualities. It was these inherent tendencies that Sharon was looking for in her evaluations of puppies. 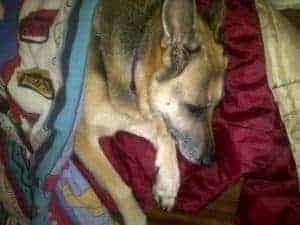 Although she informed Kyndyl about the reality of breed inclinations, she was very fair and did not “discriminate” by refusing to evaluate any dog based on its breed. Kyndyl communicated with other handlers in service dog groups, telling them why he was interested in German Shepherds and Pit Bulls. 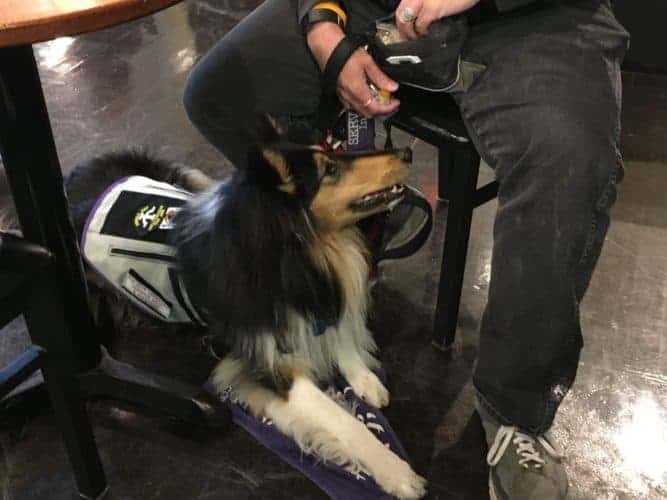 Several of them, who already had their own service dogs, recommended Collies as having many of the character traits he loved about those breeds. 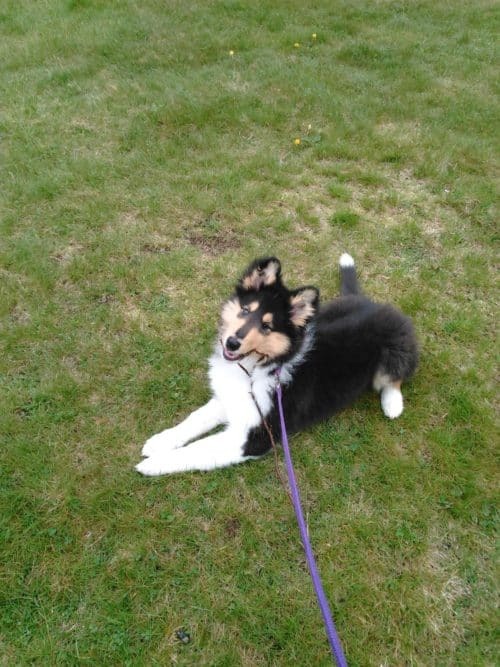 Not having any prior experience with either rough or smooth coated Collies, Kyndyl dismissed them as being too small. 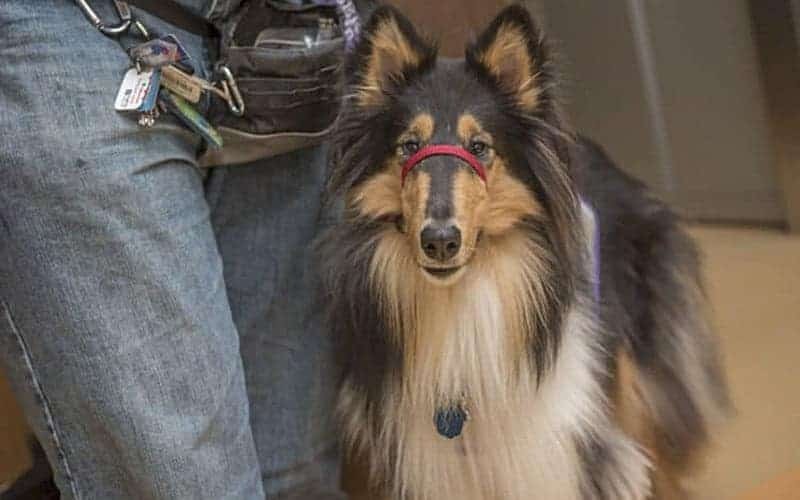 His handler acqaintances explained that he was probably thinking about Shetland Sheepdogs or Border Collies, and that Rough Collies could actually get fairly good-sized. 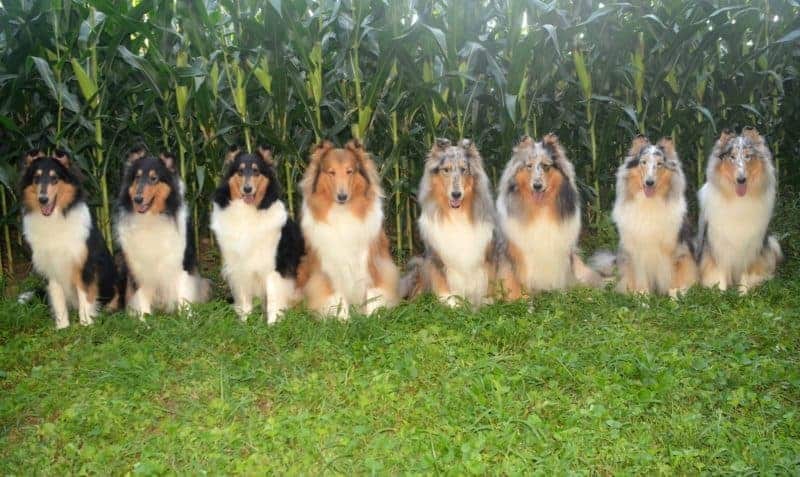 When he found Caryln, he was relieved that she focused on breeding Collies – not Collies and an assortment of other breeds. She asked him a lot of questions before even sending him an application – complete with reference requests. 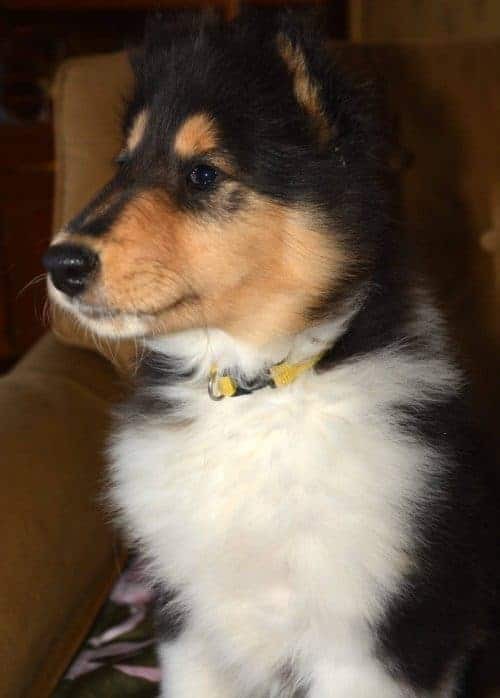 Caryln also gave him plenty of information in return: health tests done on her dogs, things about Collies to be aware of, and even contact info for her previous clients – many of whom were repeat buyers. Only after thoroughly checking Kyndyl’s references did Caryln tell him that she actually had two puppies (Hope and Dream) available in her current litter. 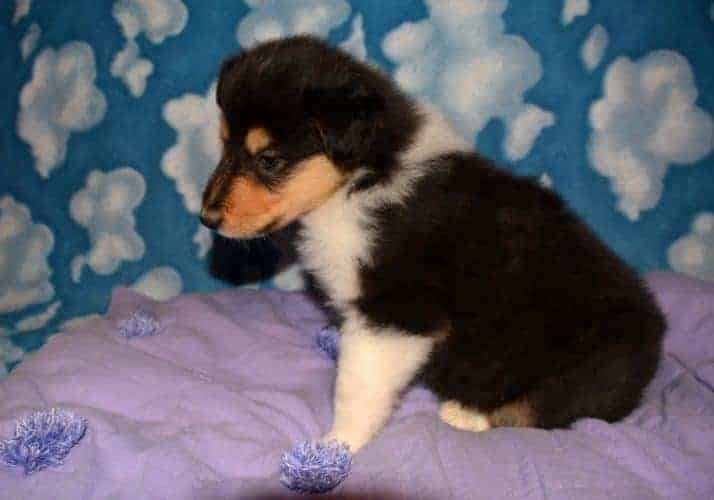 This was a mini miracle in itself, since she normally had a waiting list of months to years, and these pups were only available since two families had needed to back out of getting them. 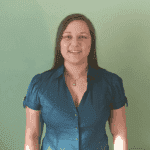 To top it all off, Caryln was not just a breeder, but also a trainer and psych professional. She had already performed temperament tests on the puppies (both the Bio Sensor Early Stimulation Program and The Puppy Aptitude Test), so Kyndyl decided to leave the final decision up to Sharon and Caryln. The women discussed the two puppies and decided that Hope would go home with Kyndyl. As it turned out, Hope was exactly what he needed. But, since Caryln had such a great reputation as a breeder, her puppies usually went for $2,000 each. Kyndyl didn’t have that kind of money lying around. Kyndyl chose to call the new pup Runa, because she had two rune patterns in her fur​​​​​​​. Runa also seems to fit her perfectly, since it is​​​​​​​ a Nordic name meaning “mighty strength.” She did indeed prove to be a source of strength for Kyndyl. Because of Kyndyl’s past experiences, he struggles with “nightmares, flashbacks, extreme anxiety spikes, and dissociation, among many other things.” Runa has helped him deal with some of these things without any training, like waking him from the nightmares that haunt him or “guiding him away from triggering events,” as he put it. These behaviors were rewarded and refined for reliability. Other things Runa has been specifically trained for, like guarding his back when he’s standing at a doorway, and interrupting overwhelming flashbacks by licking his hand. The law states that a service dog must be trained for a task, but most trainers recommend training for at least three tasks. Runa already knows four, and she’s on her way to acquiring more skills. Her latest task – something Runa naturally started doing on her own – will be to notify Kyndyl when someone is approaching them from behind, so he won’t be caught unawares and startled by an unexpected presence. The training process for a service dog and their handler is not short or easy. Both Runa and Kyndyl have had to go through many hours of obedience and public access classes, as well as private sessions with Sharon. Runa faced everything with a willingness to learn, eagerness to please, and ability to quickly switch between working, playing, or resting. Even before Runa was technically a service dog, she was already making a deep difference in Kyndyl’s life. Since Kyndyl brought her home two years ago, he hasn’t once been hospitalized for psych reasons. He even helps people by visiting them with his cat, which is a form of animal assisted therapy. Now, he has big plans. He will be moving from Massachusetts to Missouri at the end of the month and training for the clergy (a long-term dream of his) throughout the summer. He may even get a part-time job to help make ends meet. In September he will begin working toward his Masters of Divinity degree. The program will allow him to do most of his work online, though a certain amount of residence hours will need to be completed on site in Denver, Colorado. Meanwhile, Runa and Kyndyl will have continuing education courses together with a trainer via Skype, and consulting with another trainer in Denver. Runa officially attained service dog status once she was task trained, but she also passed a public access test for good measure. Still, there is always more she can learn to help Kyndyl. For instance, once they move to their new, larger house, Kyndyl plans to teach Runa to scout through all the rooms each time they return home. Sometimes his brain is convinced someone is lying in wait for him, and Runa will be able to reassure him the house is clear. But now that he has Runa, who has proved herself to be up to many tasks, Kyndyl won’t have to face those challenges alone.